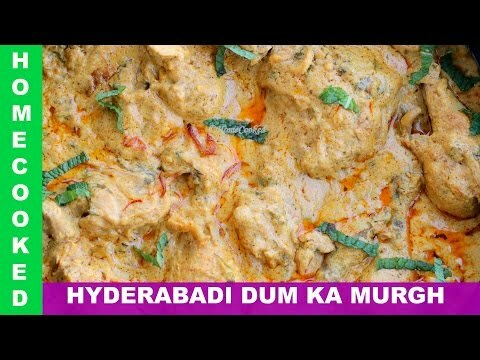 Hyderabadi Dum Chicken Hyderabad Ki Authentic Recipe....! 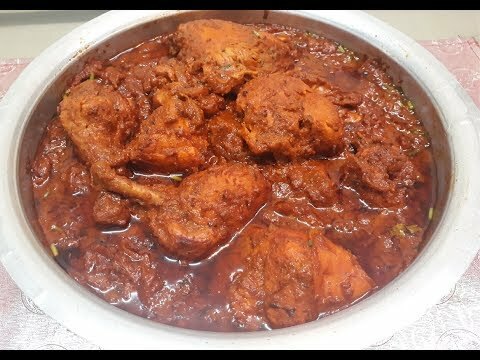 Dum Ka Red Chicken - Maimoona Yasmeen Recipes – Dum Ka Red Chicken is a very common dish served at Hyderabadi Marriages and Functions. 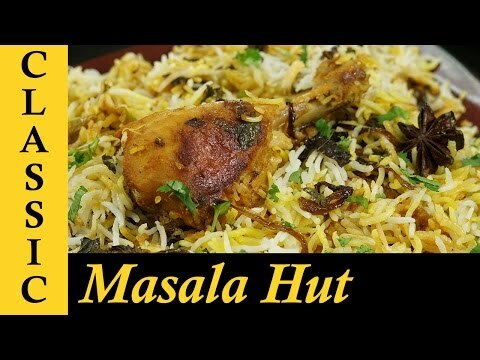 YOU CAN ALSO REACH US ON : Youtube Subscribe -https://www.youtube.com/c/hyderabadwala?sub_confirmation=1 Website - http://www.hyderabadwala.com Facebook - http://www.facebook.com/hyderabadwale?ref=hl Google Plus - https://plus.google.com/+Hyderabadwala Twitter - https://twitter.com/Hyderabadwalaa Instagram - https://www.instagram.com/hyderabadwalarecipes/ Ingredients: For 4 to 5 servings Chicken : ½ Kg Tomatoes Chopped: 6 Cashews : 80 grams Chopped Onions: 3 Ginger Garlic Paste : 1 ½ Tablespoon Red Chilli Powder : 3 Teaspoons Turmeric Powder : ½ Teaspoon Curry Leaves : Handful Chopped Coriander : ½ Bunch Spices(Garam Masala Powder) : 1 Teaspoon Cooking Oil : 4 Tablespoons Procedure: 1.Grind onions, tomatoes and cashews separately into fine pastes. Keep them aside. 2. In a cooking saucepan, add oil and when the oil is hot, add onion paste. 3. Stir till it turns light brown. Add ginger garlic paste and stir well. 4. 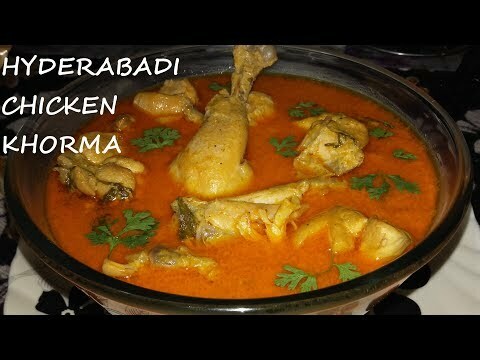 Add turmeric powder and add chicken pieces. Cook well and keep stirring for 10 minutes. 5.Add red chilli powder, salt , tomato paste and a pinch of red colour. 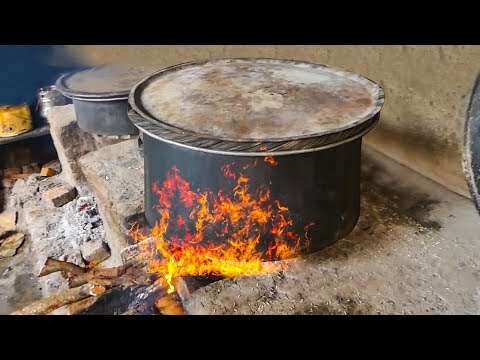 Cook well for 5 minutes till it leaves the oil. 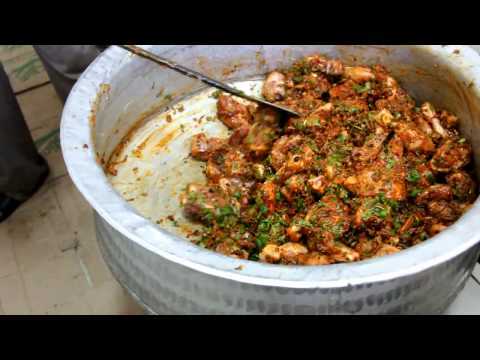 6.Add cashew paste, 1 cup of water, spices, curry leaves and chopped coriander. Simmer for 20 to 30 minutes. Delicately stir in between to prevent tearing of Chicken pieces. 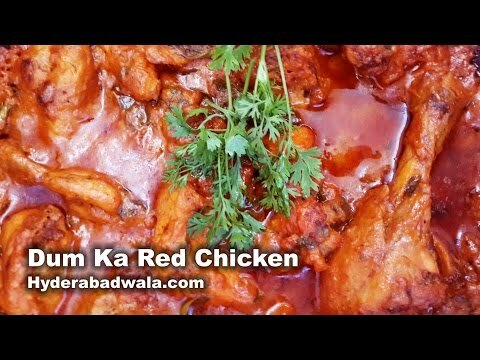 Dum Ka Red Chicken/Red Chicken made at Hyderabadi Marriage Functions from Maimoona Yasmeen’s Recipes YOU CAN ALSO REACH US ON : Youtube Subscribe -https://goo.gl/c1S3LX Website - http://www.hyderabadwala.com Facebook - http://www.facebook.com/hyderabadwale?ref=hl Google Plus - https://plus.google.com/+Hyderabadwala Twitter - https://twitter.com/Hyderabadwalaa Instagram - https://www.instagram.com/hyderabadwalarecipes/ For Chicken Marination: Ingredients: Chicken with bones: ½ kg Cashews: 10 grams Charoli/chironji: 10 grams Ginger garlic paste: 1 tablespoon Salt: 3/4th teaspoon Turmeric powder: ½ teaspoon Red chilli powder: 1 ½ teaspoon Spices/Garam masala powder: ½ teaspoon Coriander/dhaniya powder: ½ teaspoon Black pepper powder: 1/4th teaspoon Green chilli sauce: ½ tablespoon Tomato sauce: 1 tablespoon Whipped curd: 75 grams Red food colour: 2 pinches (optional) Procedure: 1. Grind together cashews and charoli into a fine paste and keep aside. 2. 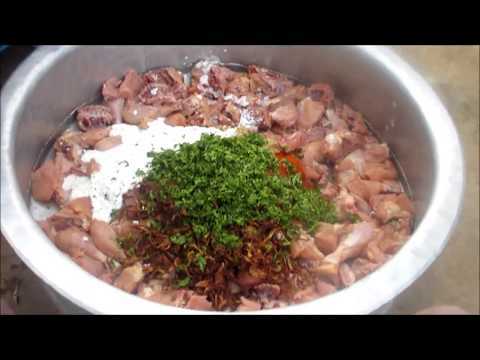 Wash medium sized pieces of chicken with bones and strain the water. 3. 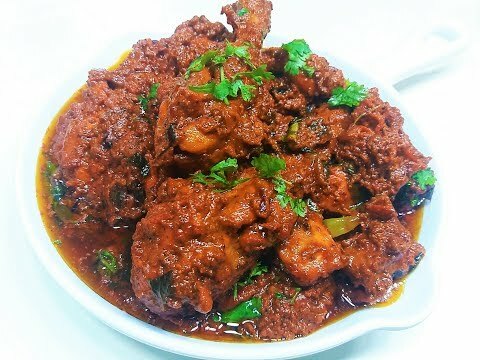 Add ginger garlic paste, salt, turmeric powder, red chilli powder, spices or garam masala powder, coriander or dhaniya powder, black pepper powder, green chilli sauce, tomato sauce, whipped curd, ground paste of cashews and charoli and red food colour to the chicken pieces. 4. Mix well and keep these marinated chicken aside for about one hour. 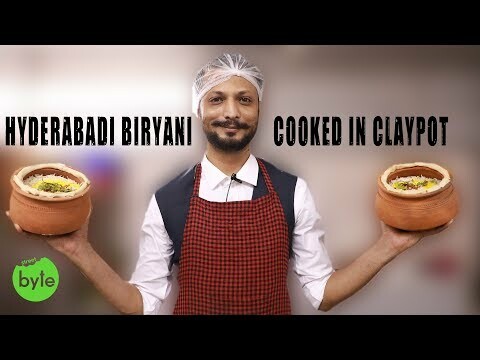 Final Preparation: Ingredients: Marinated chicken along with the gravy Oil: 5 tablespoons Onion: 50 grams Cinnamon: 2 small sticks Cardamoms: 2 Black cloves:2 Chopped mint leaves: 1 tablespoon Chopped coriander: 1 tablespoon Lemon: ½ Procedure: 1. After one hour of marinating the chicken, add oil to a cooking pan. 2. When the oil is hot, add thinly sliced onion and fry till the onions turn light brown and crispy. 3. Remove the fried onions and keep aside. 4. Into the remaining oil in the pan, add cinnamon sticks, slit cardamoms, black cloves and the marinated chicken along with the gravy. 5. 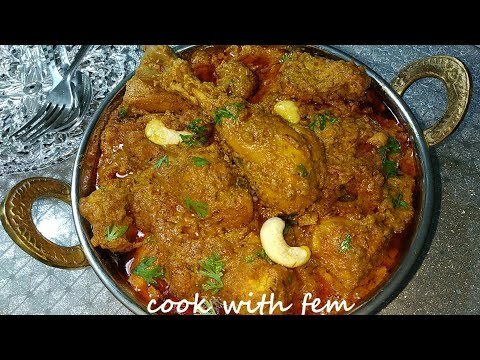 Arrange chicken gravy in a single layer in the pan. 6. Add the fried onions, chopped mint leaves and chopped coriander to the chicken gravy. 7. Close the lid and cook on low flame till the chicken gets very tender. 8. Stir at times delicately and flip the chicken pieces 9. When the chicken is 80 percent done, add lemon juice and close the lid. 10. 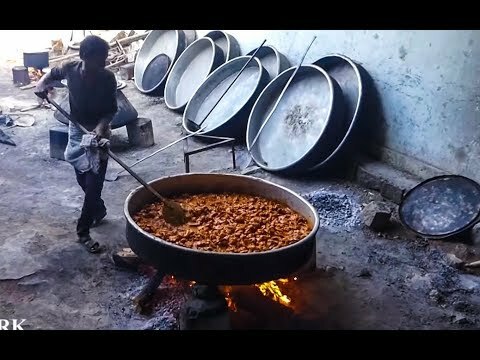 When the chicken pieces get tender and when the oil separates, switch off the flame. 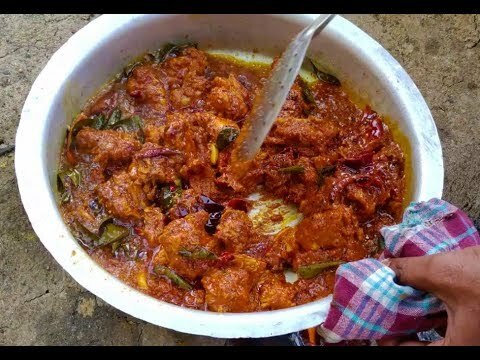 Dum ka Red Chicken is ready. 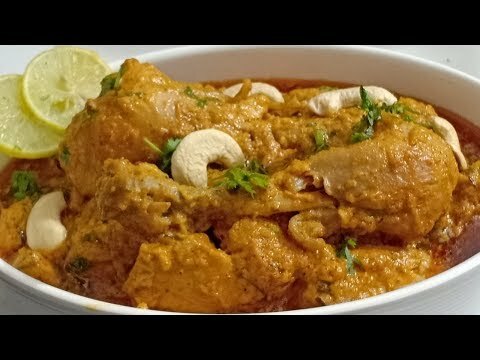 Serve with rumali roti. 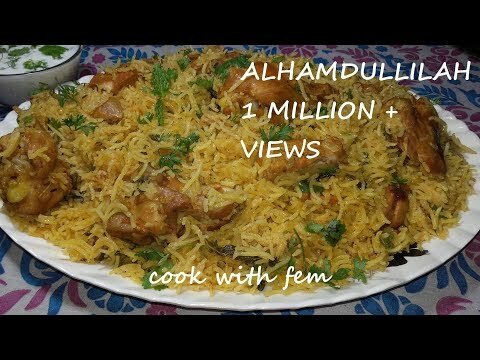 Maimoona Yasmeen Recipes - Dum Ki Chicken Biryani. 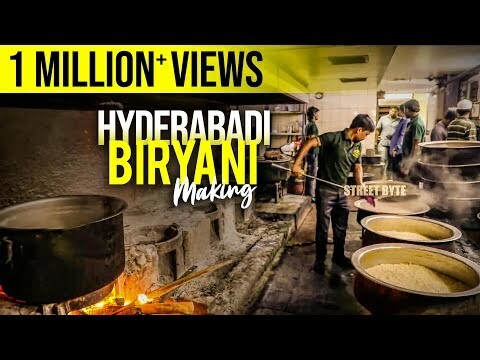 YOU CAN ALSO REACH US ON : Youtube Subscribe -https://www.youtube.com/c/hyderabadwala?sub_confirmation=1 Website - http://www.hyderabadwala.com Facebook - http://www.facebook.com/hyderabadwale?ref=hl Google Plus - https://plus.google.com/+Hyderabadwala Twitter - https://twitter.com/Hyderabadwalaa Instagram - https://www.instagram.com/hyderabadwalarecipes/ Ingredients: Chicken (medium sized pieces) : 1 Kg Rice : 1 Kg Ginger Garlic Paste : 2 Tablespoons Red Chilli Powder : 4 Teaspoons Ground Green Chillies : 7 Salt : 6 Teaspoons Spices : 1 ½ Teaspoon Chopped Coriander : 3 Bunches Mint Leaves : 3 Bunches Whole Green Chillies : 4 Chopped, Fried Onions : 4 Pure Ghee : 2 Tablespoons Cooking Oil : 5 Tablespoons Curd : 4 tea cups Lemon: 2 Procedure: For marinating the Chicken (How to make Chicken Aqni): 1.In a cooking saucepan, add chicken. Add juice of 2 lemons and keep it aside for about half an hour. 2.After half an hour, add ginger garlic paste, red chilli powder, 2 teaspoons of salt, spices, curd, one bunch of mint leaves, one bunch of chopped coriander, 3 fried onions, 5 tablespoons of cooking oil (which we used for frying the onions) to the chicken pieces and keep it aside for marination for an hour. 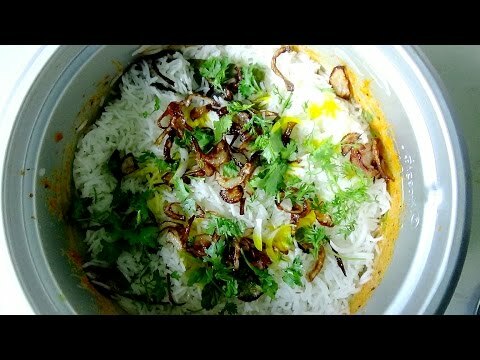 For Cooking Rice: 1.After an hour, take a separate cooking pan, add 4 litres of water, 4 teaspoons of salt, ½ bunch of chopped coriander, ½ bunch of mint leaves, 4 whole green chillies, cinnamon small sticks 4, two cloves, 3 cardamoms, 1 teaspoon of caraway seeds and close the lid. 2.When the water comes to boil, add 1 kg of washed rice. 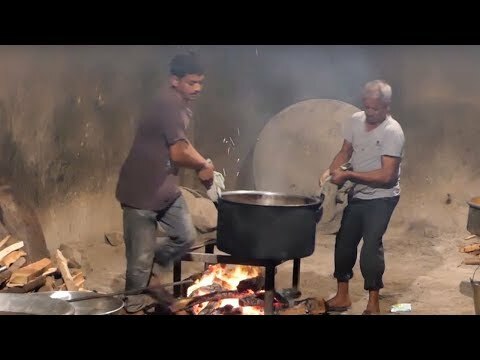 Semi cook the rice and drain the water. 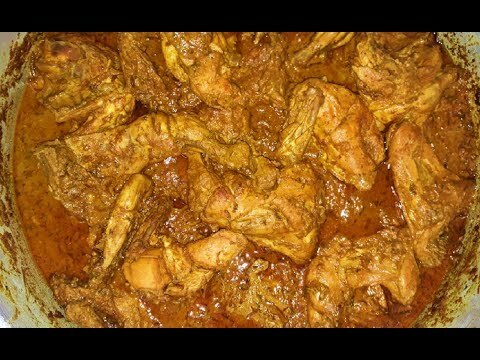 Final Preparation: 1.To the marinated mutton, spread the semi cooked rice in a layer. 2.Add handful of chopped coriander, handful of mint leaves, 1 teaspoon of caraway seeds, half cup of milk with saffron sticks and a pinch of orange colour soaked in it and add 2 tablespoons of pure ghee. 3.Fix the lid using dough. 4.Cook on medium flame for 10 minutes and then simmer for 15 minutes. 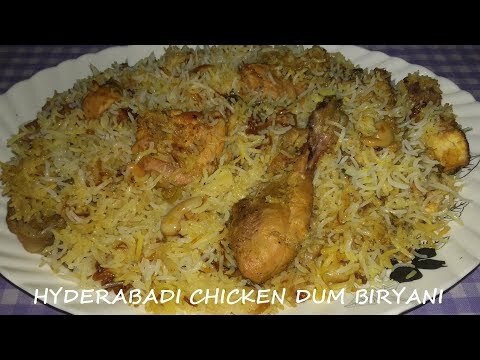 Hyderabadi Dum Ki Chicken Biryani is ready. 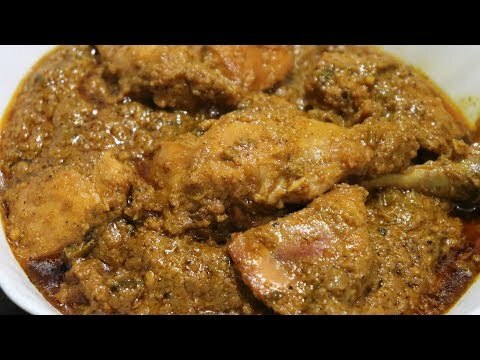 For more videos, please do subscribe to our channel : www.youtube.com/channel/UCBSwcEOp0PMwhvE6FVjgITw?sub_confirmation=1 500 chkn 1 tsp shah jeera 1 tsp ginger garlic paste 1/4 cup fried onions 1/4 cup coriander chopped 2 tbsps mint leaves 2tbsps ghee MIX WELL 1 lemon juice 1tsp red chili powder 1 tsp cumin powder jeera 1 tsp dhania powder 1/2 tsp garam masala 1/4 tsp tumeric powder Salt MIX WELL 250 gm curd Mix well 1 bay leaf 3 green cardamom 1 inch cinamon MIX WELL REFRiGeRATE FOR 1 HOUR. 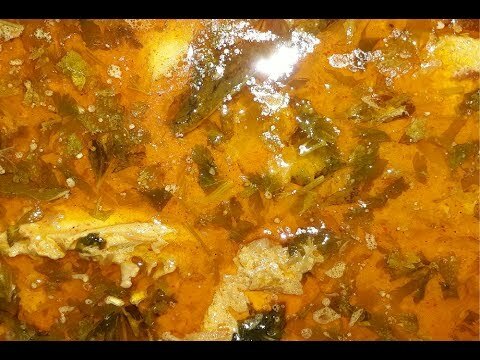 Boil 2 ltrs of water Add : 5 green cardamom 1 inch cinamon 5 - 6 cloves 1tsp shah jeera 1 tbsp ginger garlic paste 1 bay leaf 1 tbsp salt LET IT TO BOIL Add : 1 1/2 cup (1 hour soaked ) basmati rice . Cook on hi flame up to 70% done . Then trnsfer to the other pan . Add some flavors then cover tight , cook for 10 mints Done . 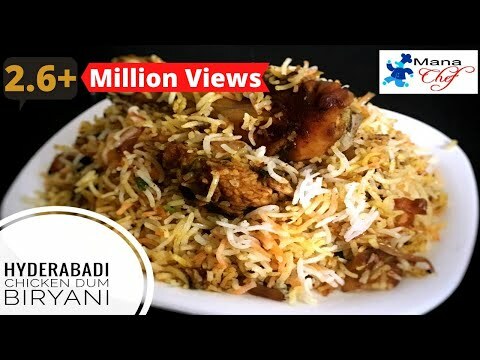 Hyderabad/Hyderabadi chicken biryani learn how to make Hyderabadi chicken biryani in a dum style in easy and simple way. 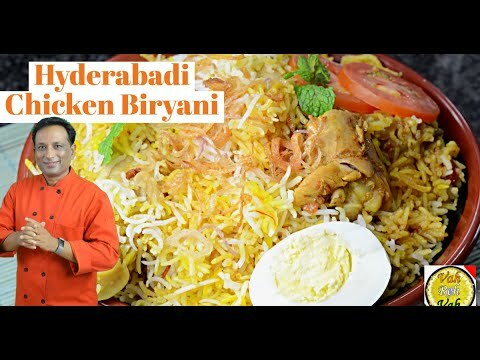 Cooking a tasty mouth watering chicken biryani is a quite lengthy process but it is very simple and this we can try hyderabadi chicken biryani recipe is perfect for a home preparation. 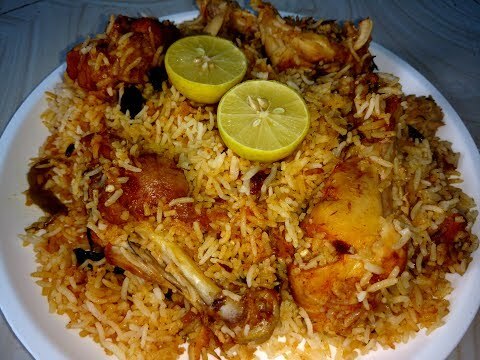 some how this is easier than all other Biryani recipes essentially it needs no sauting of garam masala spices or meat. all you need to do is just mix all the garam masala ingredients and cook on a slow dum process. 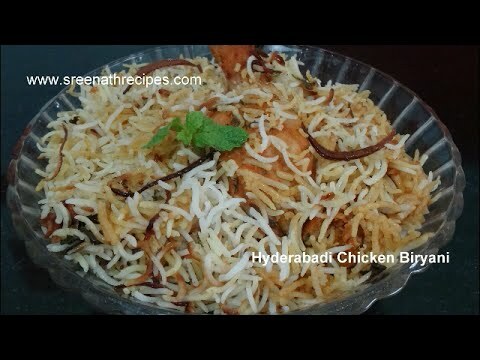 To get flavor and taste to the hyderabadi chicken biryani, juts follow the process as described in the video For Hyderabadi Chicken Biryani recipe detailed description, please check http://www.manavantillu.in/2016/03/hyderabadi-chicken-biryani.html This hyderabadi chicken biryani recipe easy to prepare and even a beginner can try without any confusion. 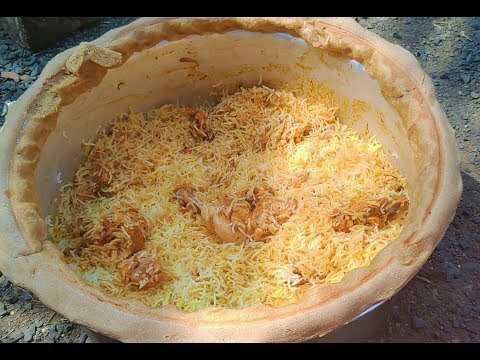 Hyderabadi Chicken Biryani from the royal kitchen of the Nizams. 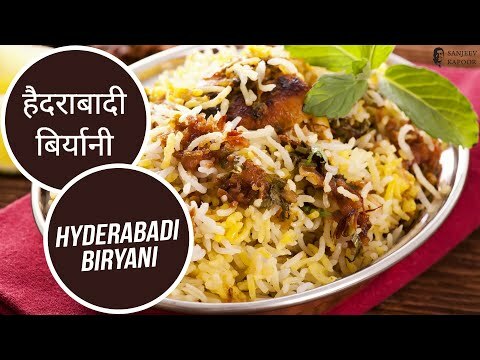 Hyderabadi Chicken Biryani recipe is an authentic Hyderabadi special rice dish which is a popular Biryani recipe of Chicken from Hyderabad served with kheera raita or pyaz ka raita and Hyderabad is famous for Biryani all across India. 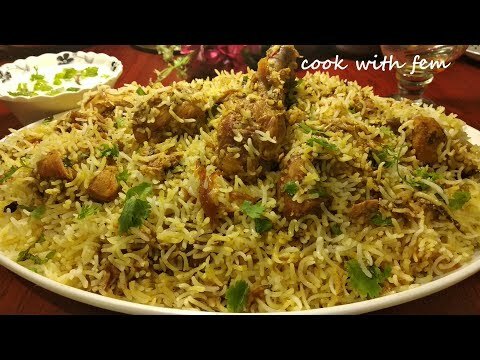 Biryani is very special to me and very close to my heart and this recipe is something which is often made in every Muslim Household. 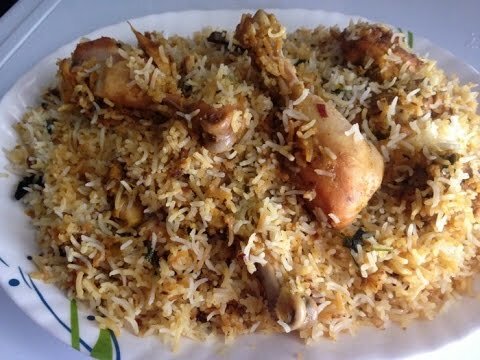 The Chicken Biryani which I am sharing today is a very delicious recipe and the steps are so easy to follow. 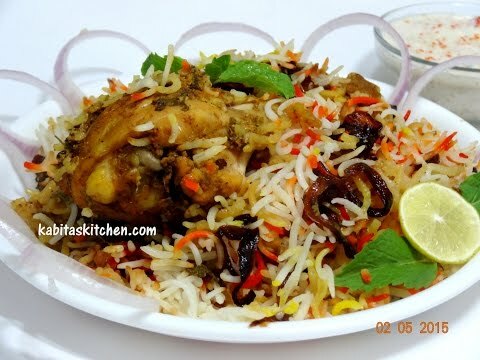 Hyderabadi Chicken Biryani is a very lengthy process but at the same time is the easiest. 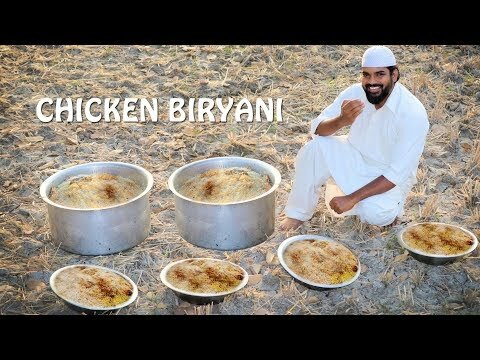 Once you understand it then you can master the art of making biryani of any kind be it a chicken biryani or mutton biryani or a veg biryani. 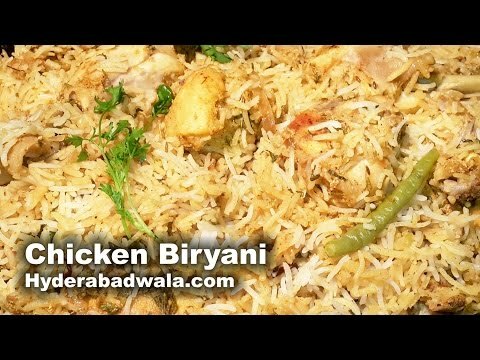 Chicken Biryani is a slow cooking process and this process is very essential to bring the perfect flavors out of the Biryani. 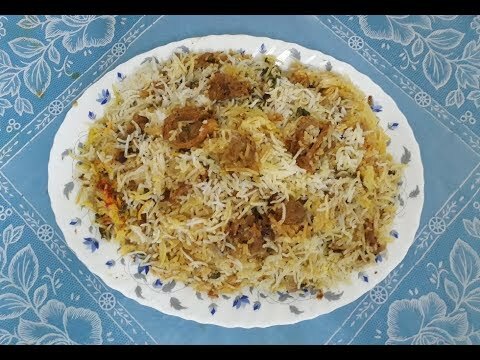 #chickenbiryani #chickenHyderabadibiryani #kachchechickenkiDumbiryani Link - Best Layer wali Lachha Paratha - https://youtu.be/fTH9OecLIX8 Mutton rogan Josh Kahmiri Style - https://youtu.be/r7yhZNxv0TA ya Friends Dumpukht Biryani (LAMB,MUTTON) already came watch it and try it, plz let me know the taste, subscribe for more recipes Awadhi Biryani (dumpukht) - https://youtu.be/MgYpOytirfs 1kg Dawat or Long grain rice soak in the water, then take Chicken-1kg, salt to taste, ginger,garlic pest 4 table spoon, cumin powder 1spoon, chilli powder1and half, coriander powder1and half spoon, green cardamom powder 1 and half spoon, mint 25 gram, 50 grambrown onion yoghurt 100gram, rose water 2 spoon, keora water 2 spoon. 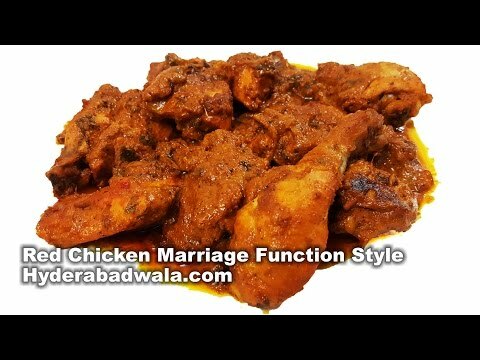 If you missed all the video please check check the recipes watch it out. 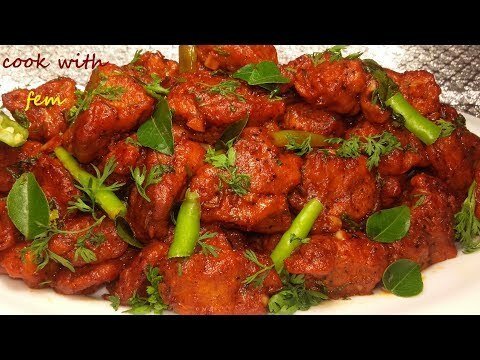 Nehari Gosht-:https://youtu.be/gavQcg3PDjY famous chicken Tikka pizza-:https://youtu.be/uZ3SMVvXuX4 European master food and wine-:https://youtu.be/2Wmnxm50TV4 Bhatti Ka Murg-:https://youtu.be/zx-x8DcV54U Kashmiri food-: https://youtu.be/FPnNa5iFGMQ Dolphin-:https://youtu.be/Ue0jsMbplkM Chicken kasturi kebab-:https://youtu.be/0lnH5a04Rvg Cheese chilli Toast-:https://youtu.be/n4B32zIfp_M Dan Dan chicken Noodle soup-:https://youtu.be/VuiqWAsx90I Crispy Peanut Masala-:https://youtu.be/S3020BBX91E Dumba BiryaniPart 11-:https://youtu.be/dOA8ohcHj9I Dumba Biryani Part 1-:https://youtu.be/EWh96aECDlU About-: (Secret master chef recipes) By chef Nurul is a you tube channel, where you will find healthy food An authentic also unique recipes new dishes & delicious food . 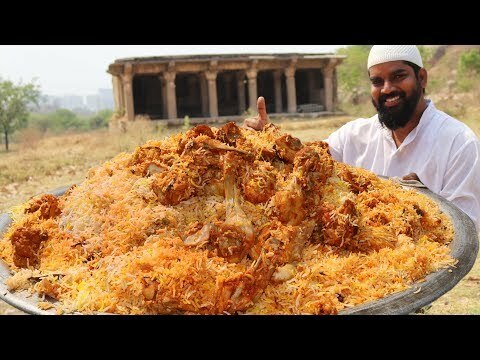 Amazing Hyderabadi Chcken Biryani ByStret Food Vendor. 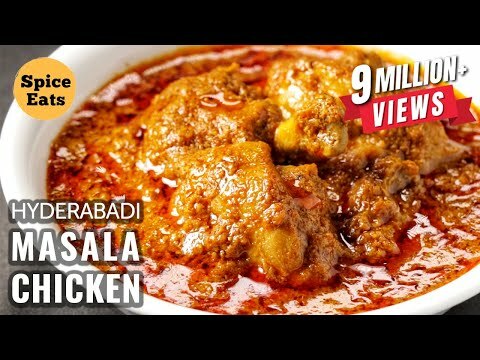 Special Hyderabadi Foods Cooked At Banjara Hill Hyderabad. Channel Title : That is how it is done! 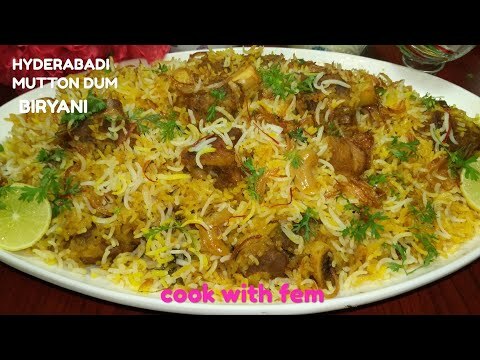 Dum Biryani Restaurant style, done at Spencer's food mart Warangal, India. 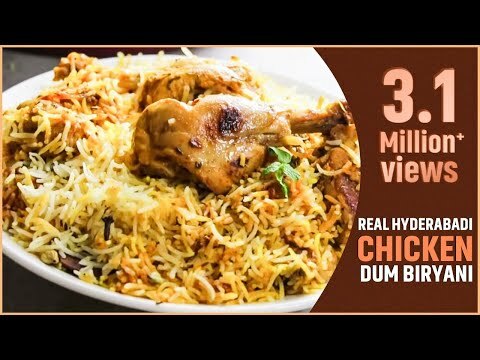 Chicken Dum Biryani Cooking By Hyderabadi Bachelor's | Hyderabad Biryani | Bachelor's Biryani Hyderabad Dum Biryani Bachelors Kitchen Hyderabad Dum Biryani Recipe How to Cook Chicken Biryani Prepared by Hyderabad Bachelros Chicken Dum Biryani Recipe Biryani Making Video How Bachelors prepare biryani in India?